(1984-1986) FM/LW/MW stereo receiver, 2x55W, Datalink, Multiroom. Though it was not obvious at the time, Beomaster 5000 was to be the last completely new Beomaster model. 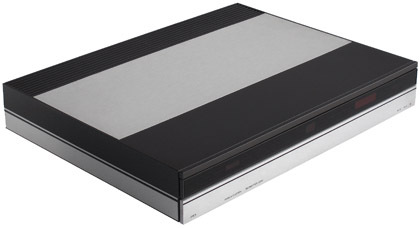 Of course many apparently new Beomasters were released later, but they were all directly derived from either the Beomaster 5000 or Beomaster 1900 family. Text copyright © Beocentral. Unauthorised reproduction prohibited. Beomaster 5000 fitted into the range below the Beolab systems, but it was not just another receiver. The aims of the design were clearly focused on advanced multiroom operation, and to take what had been achieved with Beocenter 7700 a step further. It is interesting to note that Beomaster 5000 was really a development of Beocenter 7700, which is most unusual as Beocenters were traditionally based on Beomasters, not the other way round. Text copyright © Beocentral. Unauthorised reproduction prohibited. Whilst Beocenter 7700 had shown that the two way infrared link was practical, to make this work properly with a system of separates was another matter, and required the Datalink system to be considerably refined. Advances in microprocessor technology are what made the whole thing practical, and as well as providing two way control of the entire system, the microcomputer in Beomaster 5000 also provided for the first time a really sophisticated programmable timer, which could call up any of the sources in the system. There were other advances too, for example the programming allowed a compact disc player to be controlled by Datalink, even though the suitable machine took a few years to appear. Text copyright © Beocentral. Unauthorised reproduction prohibited. There were also innovations in the radio section, which for the first time offered AM as well as FM coverage from a phase locked frequency synthesiser circuit. This meant that the 9 preset tuner memories could be set to any station on any waveband, a great improvement over the previous “4 FM + 1 AM/FM” preset arrangement of the Beocenter 7000 series or the FM only coverage of the Beolab range. Both these things are examples of how the Beomaster 5000 was completely geared to being the centre of a really practical multiroom system. Text copyright © Beocentral. Unauthorised reproduction prohibited. Beomaster 5000 was also unusual for its styling and dimensions, as for the first time these things would be dictated by the other parts of the system. Beosystem 5000, of which Beomaster 5000 was the centrepiece, was the first Beosystem where all the components truly matched in appearance and dimensions, thus giving the owner a far greater choice of positioning options than before. As a result, Beomaster 5000 from above was about the same size as an LP record (as this dictated the size of the Beogram 5000 turntable), and was only as high from the front as the Beocord 5000 cassette recorder needed to be to accommodate its mechanical parts. For such a powerful and complex machine this caused some packaging problems, though the finished result was both neat and easy to work on. Text copyright © Beocentral. Unauthorised reproduction prohibited. Even though most owners never knew, the amplifier was fitted with a cooling fan, another first for B&;O, as there was no room for a large exposed heat sink like that of the Beomaster 6000. The fan was very quiet in operation, and was controlled by a temperature sensor, so unless the amplifier was working really hard (for example playing really loudly or driving loudspeakers in many rooms at once) it would never come on. Text copyright © Beocentral. Unauthorised reproduction prohibited. There were three ways of controlling Beomaster 5000, either with the flip down front panel, which allowed access to basic functions, or with the Terminal 5000 remote control, or with the Master Control Panel 5000, which was the only way to gain access to all the programming possibilities that were available. In addition, it was not possible to alter the treble and bass settings without the Master Control Panel. Multiroom operation used of Link 82 system, which in conjunction with the Master Control Panel allowed two way communication in any connected room. Text copyright © Beocentral. Unauthorised reproduction prohibited. Beomaster 5000 was a very successful product and many were sold, though the arrival of the Beolink system and the Beolink 1000 eventually rendered it obsolete. The replacement was the very similar looking Beomaster 5500, which offered a slightly different mix of facilities. Text copyright © Beocentral. Unauthorised reproduction prohibited.